This has been an exciting week, because I’ve been the part of TWO Christmas blog hops. 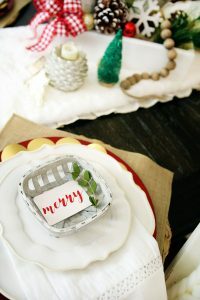 Today I’m sharing a Farmhouse Holiday Tablescape for the Christmas Festival Blog Hop, hosted by Kendra at Joy In Our Home. Today is the last day of the blog hop, but below you’ll see that we’ve had a theme for each day and you can stop by each blogger’s page to see their holiday decor! 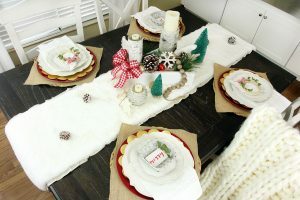 We had Christmas DIYs on Monday, Christmas Front Porches on Tuesday, Christmas Recipes on Wednesday, Christmas Mantles on Thursday and TODAY we are sharing Christmas Tablescapes! You can stop by Making it in the Mountains to see her tablescape and follow through the entire lineup. Prepare to be inspired by this group of talented bloggers! 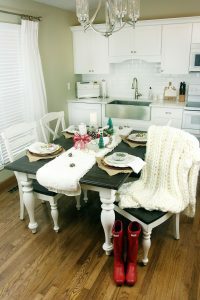 We recently had our kitchen remodeled over the summer and I wanted to share a Farmhouse Holiday Tablescape with all of you. Usually I stick to neutrals and metallics, but for this particular tablescape, I decided to add in some pops of red! This table has a leaf and can expand to sit 6, but I decided it’d be easier to share an intimate table setting for 4 people. As you can see, I enjoy mixing in a lot of textures when I work with neutrals (and the little pops of red that I added!). I think this keeps a neutral palette more interesting. 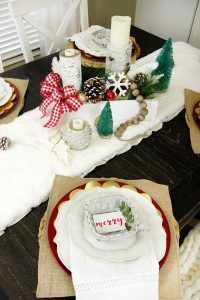 I enjoy lots of layers, as you can see in each table setting. 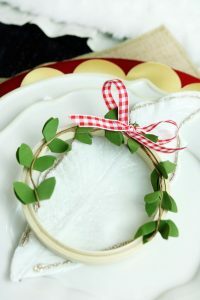 For each place setting, I made these easy embroidery hoops with a sprig of ivy topped with a red and white plaid bow. Under them you’ll see a felt lambs ear with glittery gold accents. I purchased these small tobacco baskets at Hobby Lobby and added a sprig of ivy inside each one. These tobacco baskets were ornaments, but I removed the eye hook from the top. 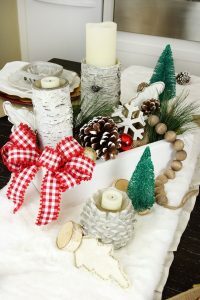 For the centerpiece, I used a white planter box (see tutorial HERE) and filled it with pine needles, acorns, more of the white lambs ear, ornaments, birch/acorn candles, slices of wood, bottle brush trees, a wooden snowflake garland and a big red and white plaid bow. 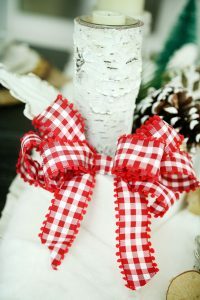 I love making my own bows for crafting and decor purposes. You can find my bow tutorial HERE. I’ve really been into wooden bead garlands. I’ve even made my own (see HERE) and love to gift them to friends. 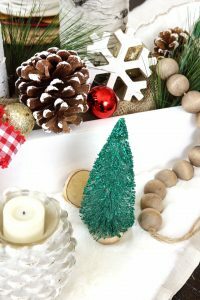 This wooden snowflake beaded garland draws the eye into the planter box. I used two table runners for this tablescape, a furry white runner and then under it you’ll find a tan runner with a ruffle edge. I just love to layer! On the place setting you’ll see I did a lot of layers once again… I layered a basketweave charger, a layer of burlap, a red metallic charger, a gold scalloped piece of paper (a cake liner! ), 2 plates with a white napkin in-between them and then the tobacco basket. Yup, not only do I love to layer my clothes… but, it works wonderfully when decorating! You’ll see my chunky knit blanket, which I draped over one of the chairs. I hope you enjoy this blog hop! Be sure to stop by the other blogs and have a Merry Christmas!